If you’re someone who prefers a vaping experience that is compact, light-weight, and reminiscent of the cigarettes that you used to smoke, then the VUSE Ciro E-Cig Starter Kit is going to be a great fit for you. This device is extremely portable—unlike some of those hefty box-mods—and the light-weight design will be an easier adjustment for those of you who recently switched to e-cigarettes. This device ranks high in the ease-of-use department. Maintenance is simple, too. Looking for a device that is straight-forward with easy set-up? Don’t want to drop a lot of cash to start vaping? Then you’re sure to be impressed with VUSE’s Ciro line. What Comes with the VUSE Ciro E-Cig Starter Kit? The VUSE Ciro E-Cig Starter Kit comes with the Ciro e-cig, three cartridges of their “V-Liquid,” and a charger for the device. This kit is perfect if you are looking for a no-fuss, ready-to-vape device. The set-up is very minimal. The VUSE Ciro contains two parts—the battery and the e-cig. Just How Easy is Set-Up? Once you have purchased the VUSE Ciro, there are only two steps to complete before you’re ready to vape. First, fully charge the battery with the USB charger included in your kit. Then, insert the cartridge of “V-Liquid.” The Ciro’s design makes for an easy installation of cartridges. Just twist your cartridge into the top of the Ciro and you’re ready to go. Depending on where you purchase the VUSE Ciro, the price may vary by a dollar or two. But don’t expect this kit to break the bank! You’re looking at $15.99 before tax, which is way less than you would be fronting for a new box mod kit. The Ciro’s cartridges hold 0.9ml of liquid. The percentage of nicotine is 1.5%, which is equivalent to the percentage in a 15mg bottle of e-juice for a mod. With a stronger throat hit, higher nicotine level, and simplicity, this is one of the best options for those of you who are new to the vape community. The Ciro’s battery, a 260 mAh, should hold a charge for about a day (or two) depending on how often you use it. Charging is simple and your VUSE Ciro will alert you with ten flashes of light when it requires charging. The cartridges of “V-Liquid” currently available for the VUSE Ciro line? Menthol, mint, melon, tropical (a blend of tropical fruits), fusion (fruit and cream), nectar (summer fruits), and original (classic tobacco). The refill packs contain three cartridges and cost around $14.99. 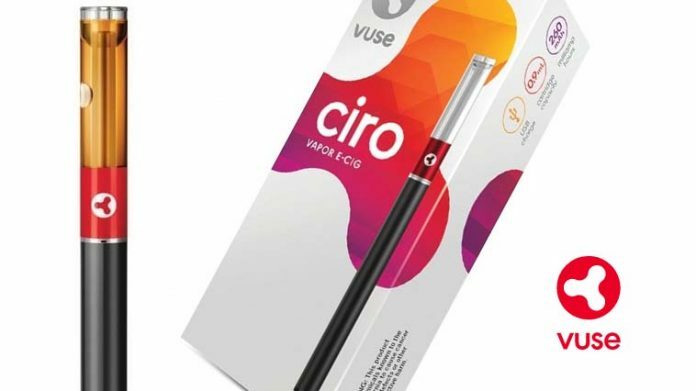 Should I Purchase a VUSE Ciro? The VUSE Ciro E-Cig Starter Kit is a fantastic choice for new vapers and recent ex-smokers. The Ciro is similar to a cigarette shape, light, and easy-to-use. Ciro’s upfront cost is less than other starter-kits available, which is easier on your wallet. The price of the refill cartridges may be a bit steep. This is something to consider if you go through cartridges quickly. On the up-side, the flavors available for the VUSE Ciro are all nicely blended and the “V-Liquid” contains a higher percentage of nicotine, so it delivers a nice throat hit. If you want to quit smoking and start vaping, the VUSE Ciro E-Cig Starter Kit is a great option—one that shouldn’t be ignored! Want to try out a VUSE Ciro for yourself? Grab one here.